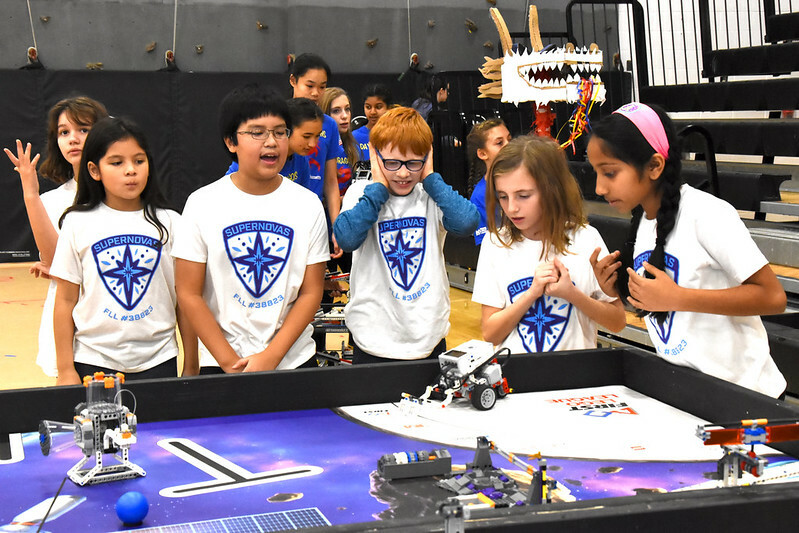 The LigerBots hosted one of our most exciting events of the year last Saturday at Newton North High School: the FIRST LEGO League (FLL) Newton Qualifier robotics competition and maker fair. 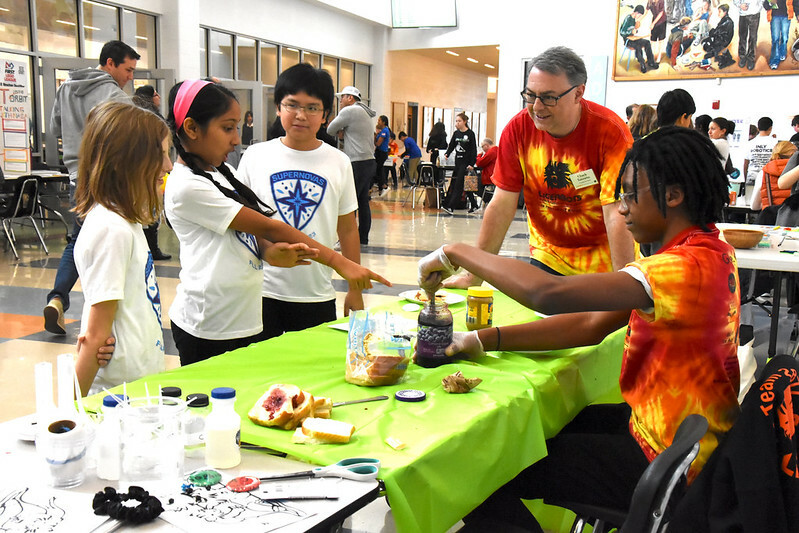 About 300 competitors, spectators and visitors attended the event–a mashup of sporting event, science fair, family reunion and dance party! 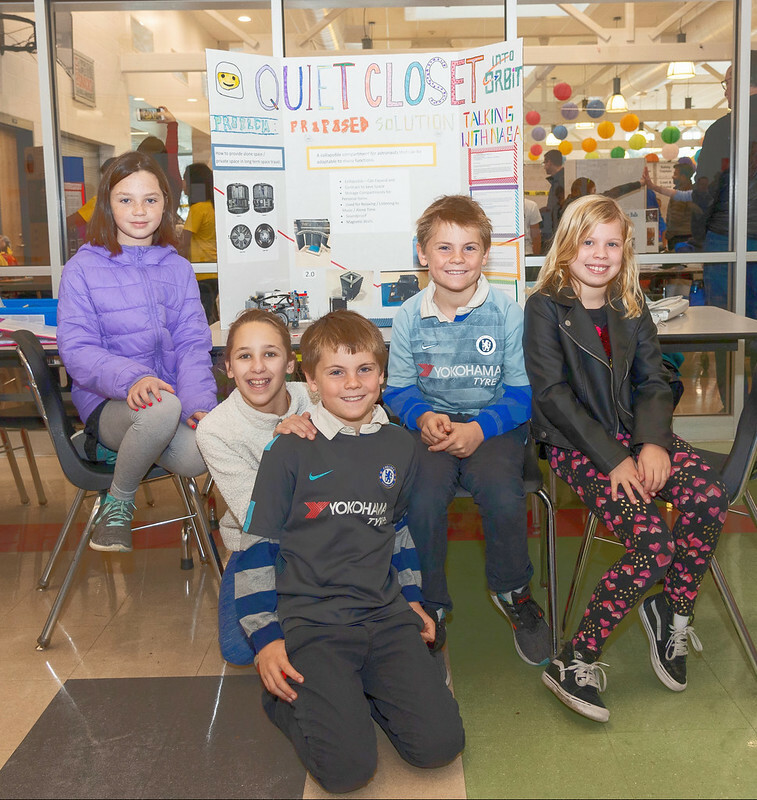 Twenty-three teams of students in grades four to eight competed with their LEGO robots in this year’s space-exploration-themed FLL game, called “Into Orbit.” The teams also displayed research projects on space-based themes. 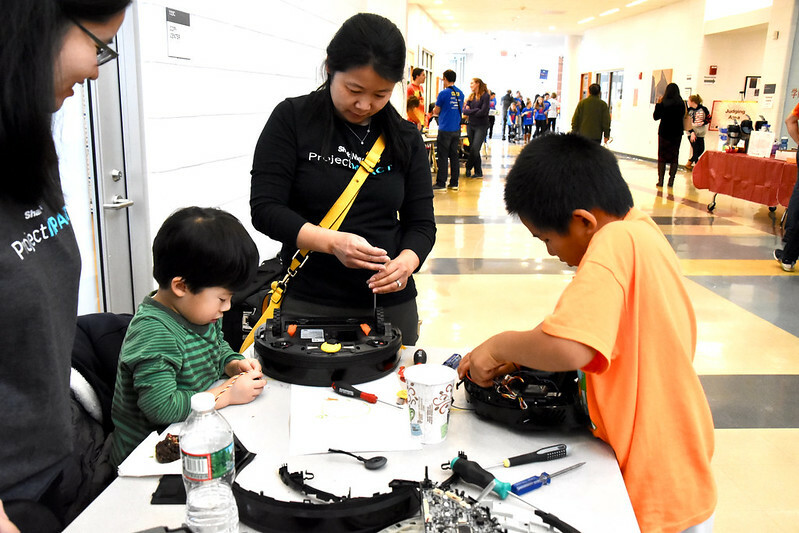 Among the six teams from Newton were the Supernovas, which is being mentored by three LigerBots students. 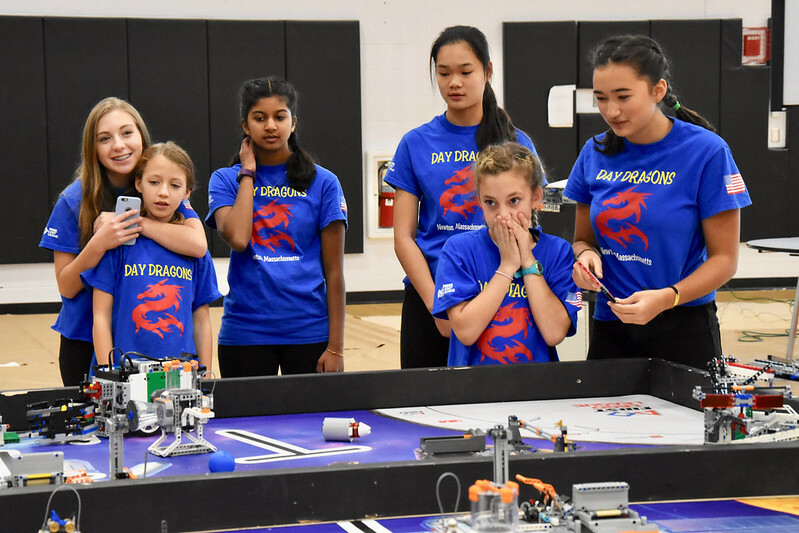 By the end of the Qualifier seven teams, including Newton-based Roaming Rovers and Day Dragons, had qualified for the Eastern MA State Championship. 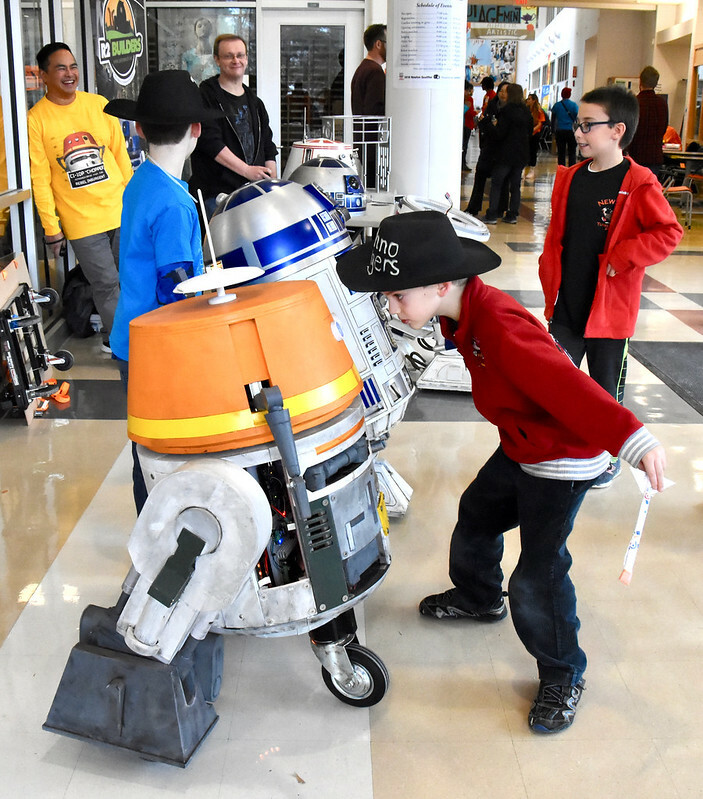 This state championship competition will include 48 teams and an even bigger maker fair, and will be hosted by the LigerBots at Newton North High School on December 15 from 9-4. Bring your families and come watch! 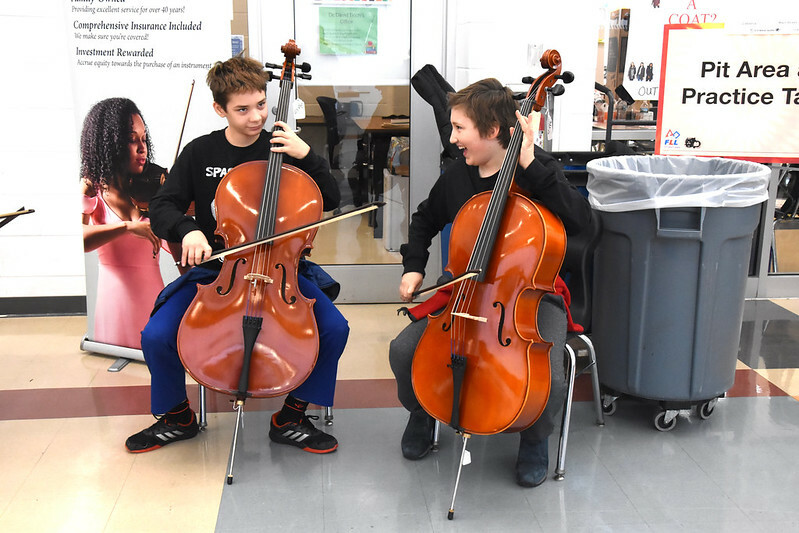 Accompanying the qualifier tournament was a maker fair featuring hands-on activities brought by local companies and organizations, including the Newton Free Library, Green Newton, Einstein’s Workshop, Empow Studios, Droid Builders, SharkNinja, Hatch Makerspace, and Johnson String Instrument. 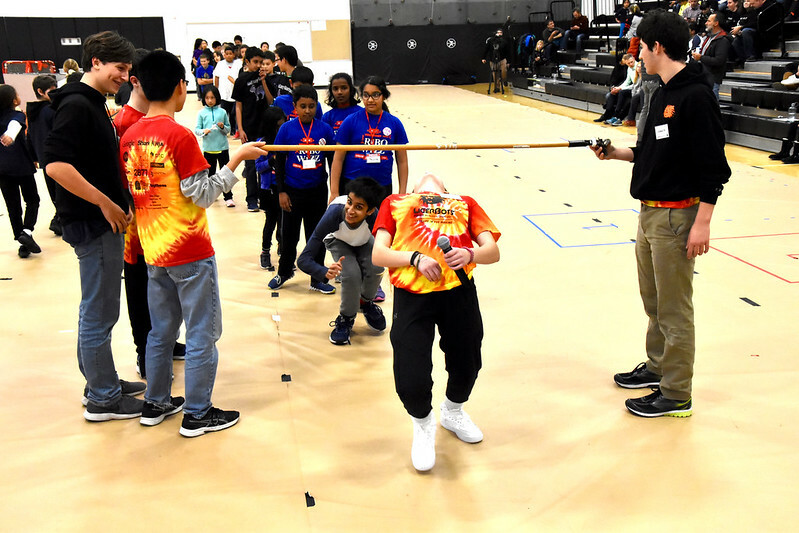 LigerBots trained with FIRST officials to be competition field resetters and referees, and our entire team staffed the event from start to finish. 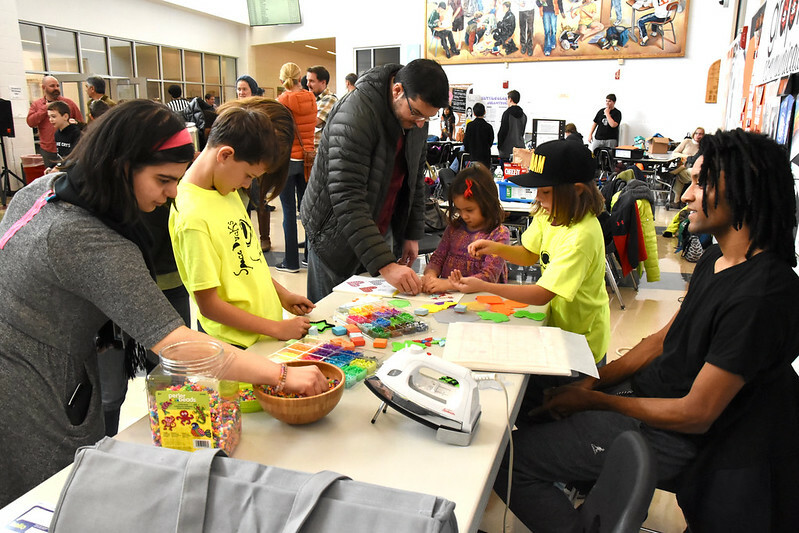 As well as doing all of the set up and breakdown for the event, LigerBots MC’d the competition, queued up teams for their matches and judging sessions, ran the concession stand, and assisted the FLL teams in finding their way through North High School. 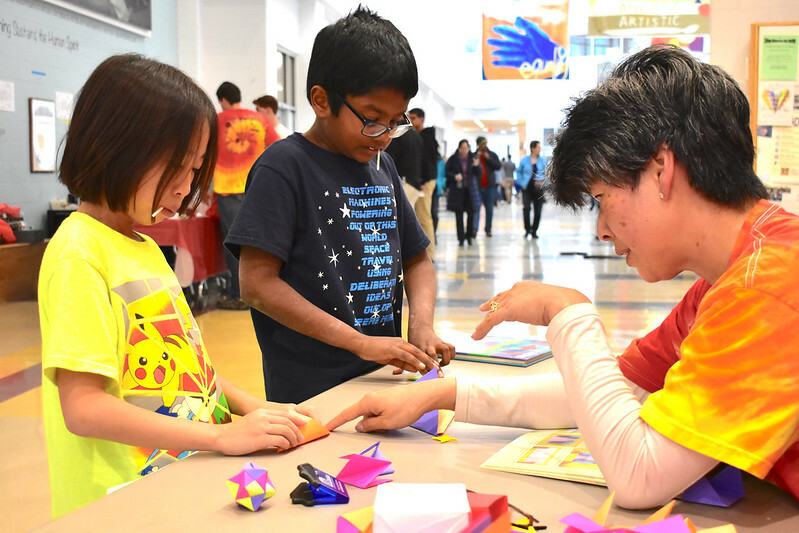 LigerBots staffed many hands-on STEAM activities of our own at the maker fair, including button making, paper airplanes, origami, 3D printing, brush bots, pb&j robot, and binary beads. And, of course, we demonstrated our own robot! Near the beginning of the event, a fire alarm was set off, forcing a evacuation. The students staffing the event handled it very well, ushering the FLL teams outside to safety. 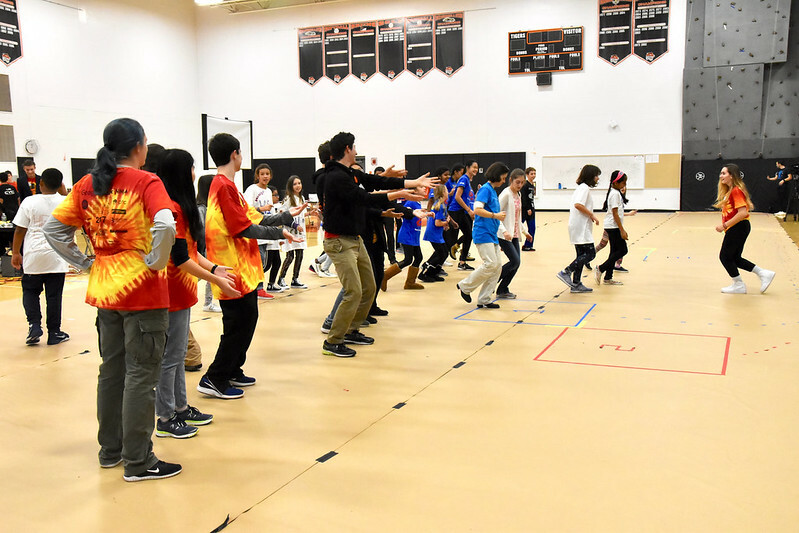 Even with the fire alarm delay we were well ahead of schedule after all the matches were finished, so we rewarded the FLL teams and LigerBots with a limbo session, dance jam, and soccer party! We can’t wait to do it all over again on December 15 at the Eastern MA State Championship! 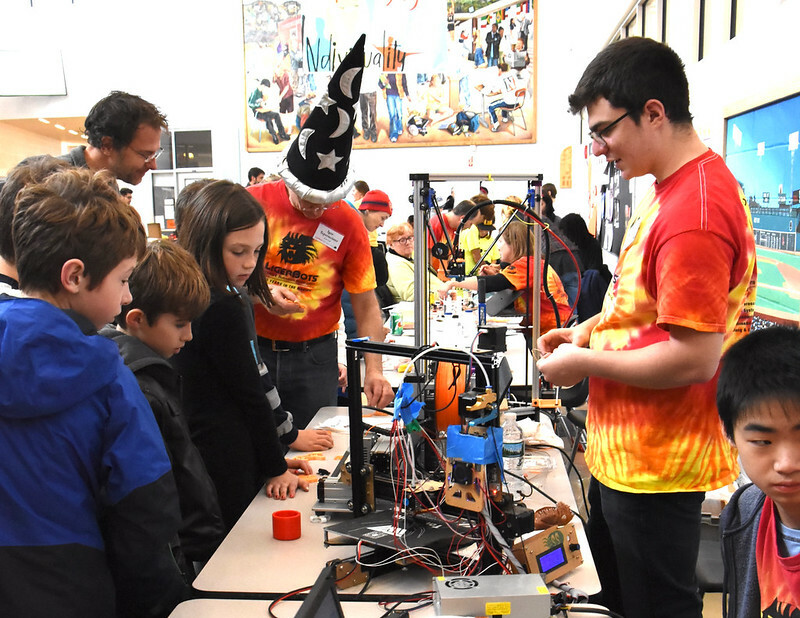 For more photos of the Newton Qualifier and maker fair, please visit our Flickr album for this event. 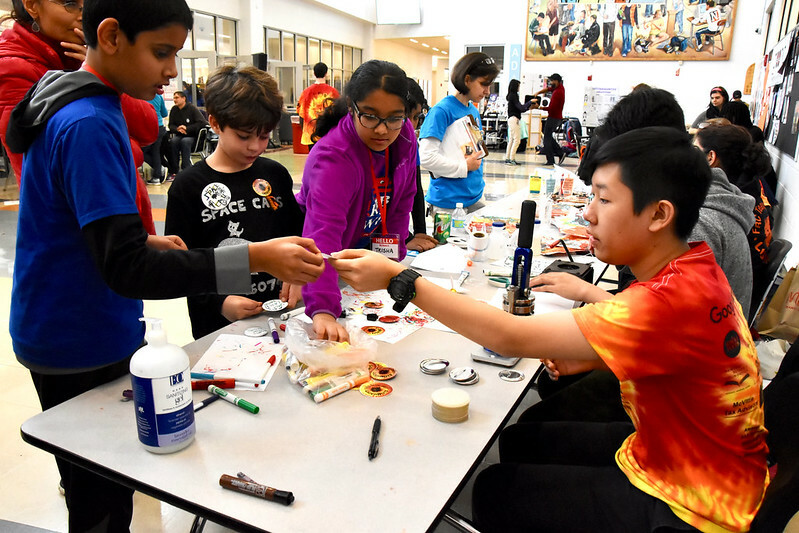 The Friday before our FLL tournament the LigerBots helped put together a Women In STEM event at Newton North High School. 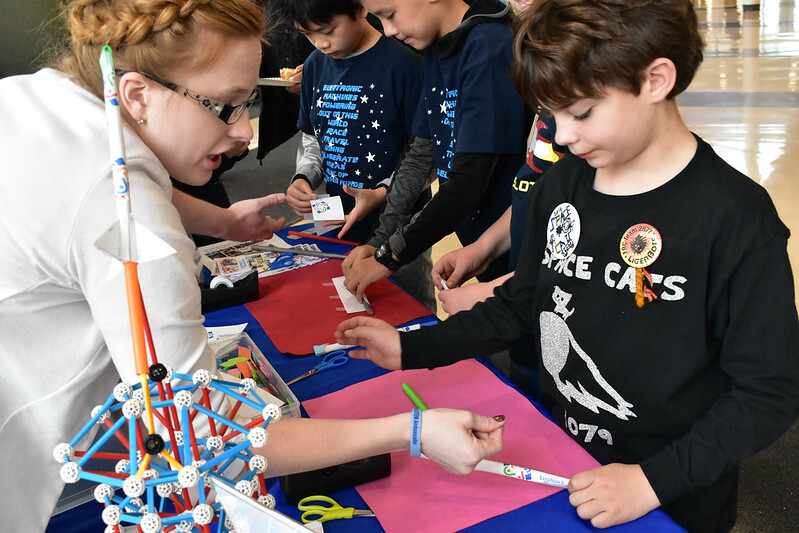 This event, which spanned the entire school day, celebrated the accomplishments of women in STEM fields with the goal of inspiring girls to pursue STEM careers. Several LigerBots worked with the Newton North science team and engineering classes to host a series of talks and question-answering sessions by accomplished women professionals in a range of STEM fields. These women discussed topics such as how they came to choose STEM careers, what obstacles and encouragement they encountered, and how they define success. Two of our LigerBots mentors, physicist Noa Rensing and software engineer Carly Buchanan, were part of the professional panel. 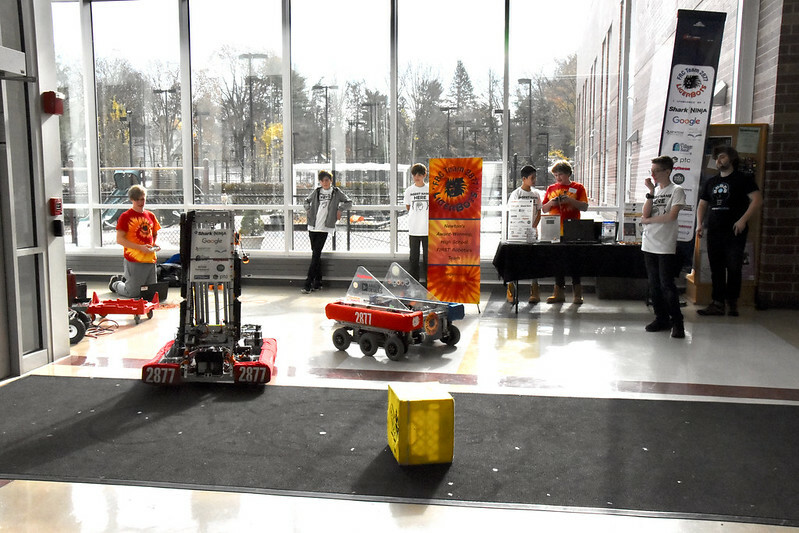 In addition, the LigerBots set out an outreach table and taught fellow students how to drive our 2016 robot during Newton North’s three lunch blocks. 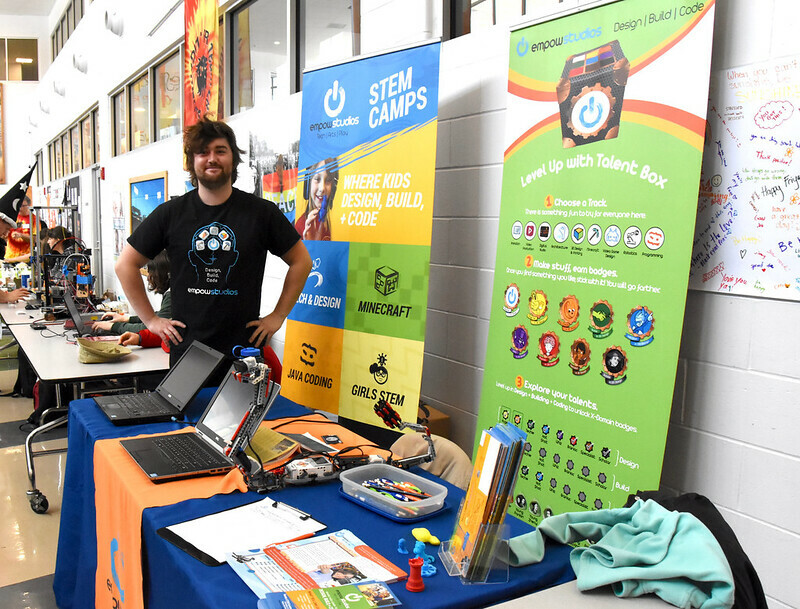 We hope that some of the students we talked to will be inspired to join our team and to pursue STEM careers!